Wood-finish flooring options top all others in main living areas of new homes. Based on our 2018 Builder Practices Survey, most finished flooring in the Dining and Living Rooms of new homes is wood or a look-alike. About half of floors in new home Foyers/Hallways, Kitchens, and Family Rooms have a wood appearance. With kitchen and bath cabinets traditionally having wood finishes, builders have often avoided wood “overkill” in these rooms by spec’ing non-wood floor finishes. But, with the new trend of incorporating bold-colored painted or laminate kitchen cabinets, wood flooring options are gaining popularity in kitchen design. Wood has made only a modest dent in some areas of the home. In Bedrooms, for example, wood finishes only represent about 15% of flooring installations. In Bathrooms, while still less than 10%, it should continue to rise due to the new LVT category and growing popularity of wood-finished ceramic and porcelain tiles. In Basements, it’s still less than 10%, and with homeowners and designers leaning more toward informal and comfortable aesthetics in this section of the house, Basements will likely remain the domain of carpeting. The traditional look in high-wear areas of the home, and those that are prone to getting wet, is ceramic tile or stone. Historically, these materials have offered superior resistance to moisture and physical abuse in Bathrooms, Foyers, and Kitchens. From an interior design perspective, tile and stone finishes are the “correct” choice for these areas of the home. Vinyl sheet and tile patterns mimicking ceramic tile or stone have become a low-cost, easy-to-install (and maintain) alternative to natural materials. In Bathrooms and Powder Rooms, tile and stone floors are still most popular by far accounting for more than 90% of new home flooring installation. Only in the past few years have water-resistant LVT flooring and ceramic/porcelain tiles designed to look like wood planks begun to make wood floors in bathrooms seem correct. In Kitchens, the rising popularity of wood has been at the expense of tile and stone styled floors, resulting in a drop from nearly 80% to about 50% of Kitchens today. 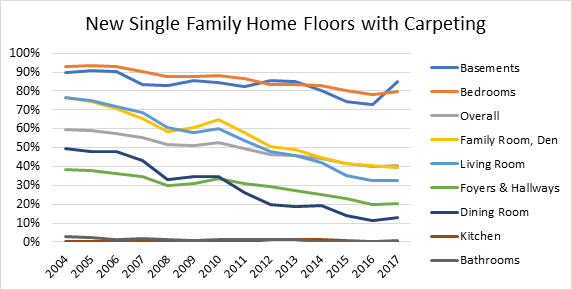 Since 2004, carpeting has declined from about 60% of all flooring installed in new homes to about 40% today, primarily losing ground to wood finishes. In new home Basements and Bedrooms, however, carpeting continues to hold 80% or more of the share of flooring installations. 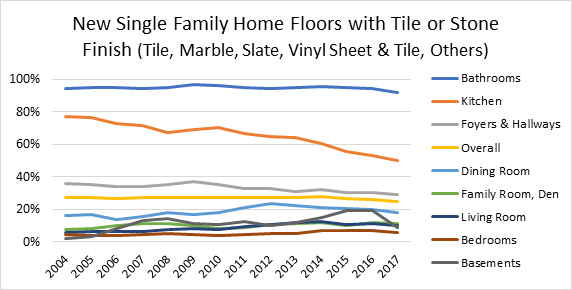 The home design trend toward increased basement space in many areas of the country has resulted in a slight increase of flooring product usage in Basements. Because basement renovation appears to be one of the fastest growing expansion areas in renovation design, it’s no surprise to see carpet use increasing for that space. 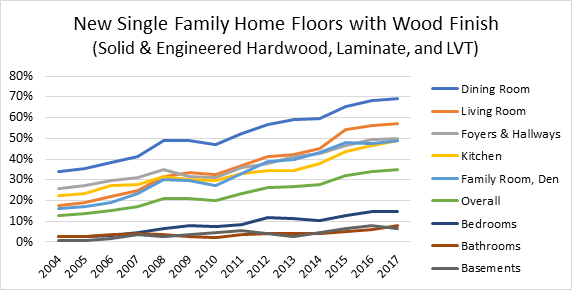 The biggest declines for carpet have been in the Living Room, Family Room/Den, and Dining Rooms of new homes—specifically where wood finishes have seen some big gains. These are also the primary common areas of the home and places where entertaining of guests are centered. While this article does not delve into flooring trends in home replacements, our 100,000-response Annual Consumer Practices Survey reveals that some of same trends and themes are true in that market as well. Home Innovation’s newest reports are now available with data for metropolitan areas and counties, allowing you to track flooring market opportunities at a very fine geographic detail. Interested? Get in touch – you’ll be floored by how much data we have to offer!